See details Miniature Medieval Catapult. 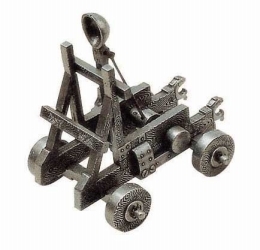 MINIATURE MEDIEVAL ALL METAL CATAPULT: This miniature reproduction of the famous siege weapon is of all metal construction, with working ratchet and firing action. Features: Measures 5.5" x 4.5" x 5"